A lot going on, but we’re alive! We got back from our honeymoon cruise on Saturday, went to dinner with Adam, and just tried to calm down. 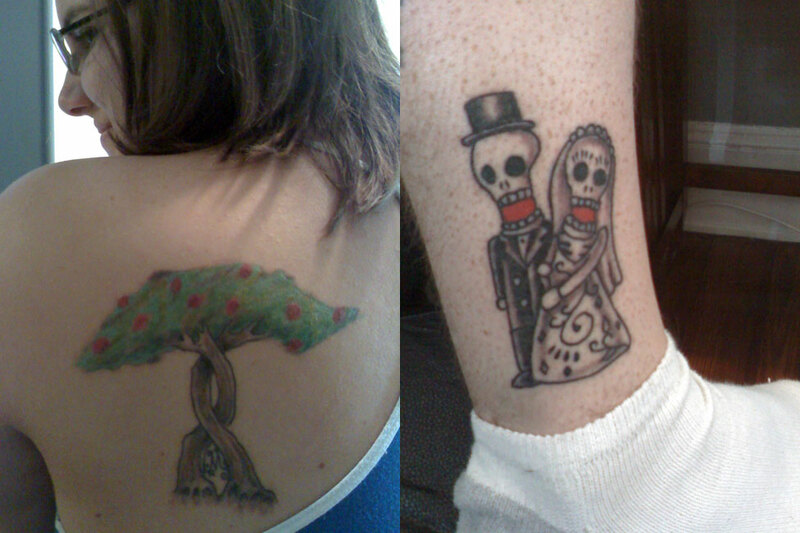 Lori worked yesterday and I was busy trying to get the house clean (didn’t happen), and then we got tattoos. No pictures yet, but here’s a description. Mine (Daniel) is our wedding cake topper, bride and groom skeletons, and Lori’s is two tree trunks that intertwine to become one blooming tree. Since it’s Lori’s birthday today we probably won’t have any photos up tonight, but we’ll definitely have some pictures and commentary about our boat experiences tomorrow. Since we haven’t updated here in a month, we just wanted everyone to know we’re not dead, the boat did not (but felt like it would) tip over, and we weren’t kidnapped and forced to braid hair in the Bahamas. We also proved that this marriage will last forever. Being trapped in a small room, on a boat in the great wide ocean, spending every waking and sleeping moment together (except for bathroom breaks), with nowhere to run to or escape, neither of us jumped off to get away from the other. It was great. We are awesome and in love! Forever!